The final tally of participants was 6 people on 5 bikes; Dietmar Kohls, Robin Lahiri, Brian Day and myself from Chelsea & Fulham, my co-worker Paul Wright and my son Simon. Paul was borrowing my Sportster for the weekend and Simon was pillion on my Wide Glide - his first trip over 25 miles on a motorcycle. 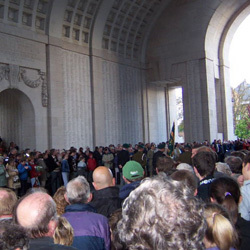 The itinerary was fluid, with only two fixed times for the weekend; 8 o’clock Saturday evening for the Menin Gate ‘Last Post’ ceremony, and the booking-in time for the return ferry. I had been brave enough to print some tee shirts showing the places we were going to visit, and we managed all of them plus a few more. The weekend started rather early when Dietmar turned up outside my house at 4.35am on Friday 6th May. Only 40 minutes early, Dietz, keep practising! 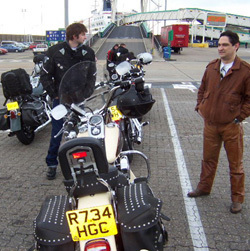 We met the others in Dover as planned, and the ferry left on time. ‘Full English’ breakfast on board occupied most of the 90 minutes crossing time and we were soon in Calais looking for petrol. This found, the satellite navigation made its first contribution. There was no way that I could have reconnoitred the routes before setting off, and poring over maps in the wee small hours merely provoked headaches. Ergo the cunning plan was to use ‘sat-nav’ where we merely entered the desired destination into the machinery and sat back until the voice inside your helmet said ‘turn left’ or ‘turn right’ etc. Hmmm. I’m not convinced that the technology is mature, as we got used to seeing a lot of Belgium and France over the next few days, sometimes the same place from several different directions. I swear that we made two laps of Calais before finding freedom but soon enough we were in Bergues for lunch. This was one of my few opportunities to stun the multitudes with my near fluent restaurant French, not too difficult when ordering sandwiches, drinks and cheese on toast. After lunch we went cross-country to Dodengang, near Dixsmuide. The ‘trench of death’ occupies the same place in the Belgian psyche as Verdun does for the French. The entire Belgian army was rotated through the trenches and breastworks fronting onto the Yser River throughout four years of static trench warfare. After lunch the First World War theme continued as we visited Tyne Cot Cemetery. This had a partly personal reason, as my wife’s grandfather’s elder brother Johnny Minshull is commemorated on the wall amongst his ‘pals’ from the 17th Battalion Lancashire Fusiliers. Of the four Minshull brothers three died on the Western Front and the fourth only lived until 1926 when he died of ‘black-lung’ in the year my wife’s mother was born. Life certainly was hard in those days. Tyne Cot is the largest Commonwealth War Grave in the world, with nearly 12,000 burials (70% ‘unknown’) and 35,000 names of the missing. The navigation remained problematical, but Robin leapt to the rescue and got us into Ieper (Ypres) along the correct road, so we thundered in dignified formation through the Menin Gate in our own sonic tribute to the fallen. Having located a temporarily missing Brian and checked in to the hotel, the first of several sharp skirmishes with Belgian beer commenced. The half litre Leffe blondes went down seamlessly for a very ‘happy hour’ until it was time to return to Den Anker, my favourite Ypres eatery. Disaster - the mussels were off! Our re-acquaintance with the third member of the trilogy of Belgian gastronomic specialities (the others being chips and beer) would have to await the new day. Since we’d been up since 4.30am (Thanks, Dietmar) and driven 180 miles it was time for an early night. We’d also been pretty lucky with the weather. Saturday dawned bright and clear, then became wet and horrible. The church bells behind the hotel opened fire at 7am, so that was it on the sleep front. The plan entailed visiting the local Harley dealer to buy a tee shirt and collect the parking directions for our visit to Bruges. Having the exact address made the navigation straightforward, and we were warmly welcomed with free coffee at ‘Harley-Davidson Marc Tandt NV’. We left a ‘tour tee-shirt’ for the local H.O.G. chapter and made our way into Bruges along a very wet and very windy motorway. The safe parking turned out to be Bruges police station, so after an exchange of pleasantries with the constable on duty at the front counter and gaining permission from the Duty Officer, the back gate opened and we were parked in probably the most secure Harley parking in Belgium. Paul and I are used to police stations, and take it from us, this was one was absolutely typical, down to the glum family awaiting bail and the row of confiscated mopeds gathering dust in the back yard. We got back to Ypres in plenty of time for the 8pm Menin Gate ceremony. Every year since 1928, the local Bruges fire brigade buglers have sounded the Last Post under the Menin Gate arch, in commemoration of the fallen of the First World War. The Menin Gate memorial is engraved with many more of the ‘intolerably nameless names’ of the dead of the War who were denied the dignity of a grave - 54,000 names. More shopping followed, and then dinner - superb steaks washed down with Ypra beer and a more than passable red wine. And so to bed. Sunday morning was check out time. 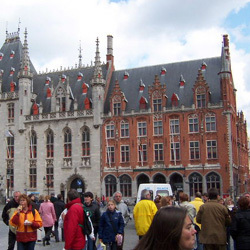 The day’s plans included lunch in Arras and getting back to Calais in time for the late afternoon ferry. We supplemented that with a quick trip up to the Canadian Memorial on Vimy Ridge and a visit to a German cemetery in Sailly-sur-la-Lys, to sort of balance things up for Dietmar. And so back to Calais where the ferry was delayed for an hour. Farewells at the docks preceded the homeward leg of the journey, which had the worst weather of the weekend. Home by 8.45pm, 533 miles covered.